Each colour has a special meaning which you may want to incorporate into your designs. We have listed flowers that come in variety of colours, so you can easily blend your favourite flowers together. Yellow Wedding Flowers – the colour yellow means optimism, enlightenment and happiness. It is believed that shades of golden yellow carry a positive future. Yellow is a brightening colour which is popular for sunny outdoor weddings. Why not mix cheery sunflowers with delicate yellow freesias for a scented summer bouquet? Or mixing yellow sunflowers with orange dahlias to create a contrasting vibrant design. Bright yellow wedding flowers are vibrant, punchy and vivid. Blending pale yellow calla lilies with white roses can create an elegant subtle blend to a traditional white bouquet. Pink Wedding Flowers – The colour pink represents youthfulness, excitement and cool; it is the colour of happiness and is often regarded as merry. Pink is one of the top wedding flower colours choices amongst UK brides. Many brides love pretty pink flowers in their bridal bouquets, flowers such as roses, freesias and bouvardia are very popular for spring weddings. Some pink wedding flowers include: Ageratum, Alstroemeria, Amaryllis, Anemone, Anthurium, Antirrhinum, Aster, Astilbe, Astrantia, Bouvardia, Callistephus, Carnation, Celosia,Chamelaucium, Chelone, Chrysanthemum, Cirsium, Clematis, Cymbidium Orchid, Cynara, Dahlia, Delphinium, Echinacea, Eustoma (Lisianthus), Dendrobium (Orchid) Freesia, Gerbera, Gladioli, Hyacinths, Hydrangea, Larkspur, Liatris, Lilies, Peonies, Phalaenopsis Orchids, Phlox, Prunus, Ranunculus, Roses, Rudbeckia, Sapanaria, Scabiosa, Sedum, Snowberry, Spray Roses, Stocks, Sweet Pea, Sweet William, Syringa Tulip, Vanda Orchid, Veronica, Wax Flower, Zantedeschia (calla lilies) and Zinnia. Blue Wedding Flowers – Many people believe that you cannot grow natural blue flowers, but this is far from the truth. Many flowers can be sourced to the UK ranging from a colour palette of sky blue to deep navy. Blue is very popular colour for UK weddings. The colour means trust worthy, reliable and dedicated. The colour of the sky and ocean, blue is perceived as a constant in our lives. Blue hyacinths mixed with white roses makes a great spring bridal flower bouquet or even mixing nigella, muscari and hydrangea makes for a mixed beautiful blue bouquet during the summer. Green Wedding Flowers – Green is the colour of nature, richness and life. Grass-green is the most restful shade. Green symbolises self-confidence, happiness and balance and is a lovely colour that works in many settings and venues. There are many natural green flowers that are available for UK wedding. If you are looking for soft pastels or funky and vibrant, then there is so much variety to choose from. Soft greens work well with pastel pinks and creams, Combine flowers such as white roses, viburnum and pink freesias for a delight English country garden wedding bouquet. Orange Wedding Flowers - Orange is fun, flamboyant and radiates warmth in a bridal flower bouquet; Orange flowers are popular in late summer and autumn and can even include tropical flowers as a reminder of summer holidays. The colours range from terracotta, ginger and rust and can have a beautiful autumnal feel. Mixing orange and green flowers would be suitable for an autumn wedding, Tom pearce chrysanthemums arranged with orange roses and red oak would look stunning for any September wedding ceremony. Red Wedding Flowers – Red is the colour of love and passion and is very popular for wedding ceremonies. Red roses are a sign of romance and affection and can shade from cerise to burgundy. Red wedding flowers can be perfect all year round. If you are having a Valentines wedding then decorate your bridal bouquet with red roses, red cordyline leaves, red calla lilies and red anthuriums. If you are having a Christmas wedding then mixing red roses with cinnamon sticks and red baubles creates a festive bouquet. White Wedding Flowers – The colour white symbolises purity, clarity and wholesomeness, as well as innocence and virtue. White is the traditional colour to have as wedding flowers, from the Victorian times, white has always been used within royal bouquets. White wedding flowers add an heir of sophistication and elegance. 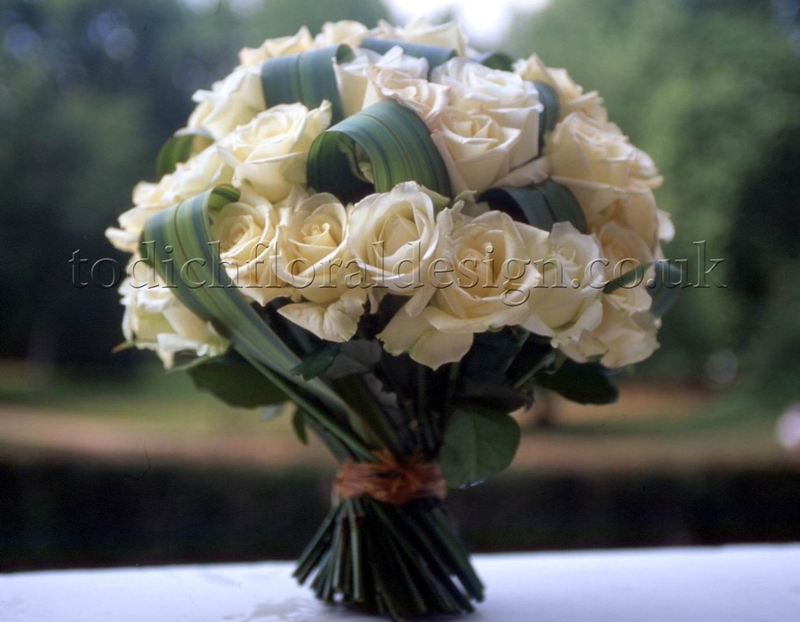 White wedding flowers are classical and timeless and will always be popular for UK weddings. White bridal flowers are great for winter weddings or even if a bride is keeping to a minimal colour scheme. Purple Wedding Flowers for London brides – The colour purple balances the stimulation of red with the calm of blue. It has royal associations and is the favourite colour for modern brides. There are many flowers available all year round in the colour purple. Purple wedding flowers work well with whites, pastel pinks and creams. Memory lane roses look beautiful mixed with purple freesias, purple cornflower and cream spray roses. Some purple wedding flowers include: Aconitum, Agapanthus, Allium, Alstroemeria, Anemone, Anthurium, Aster, Campanula, Celosia, Centaurea (Cornflower),Cymbidium Orchid, Dahlia, Delphinium, Dendrobium Orchid, Dianthus, Eustoma, Freesia, Gentiana, Gladioli, Hyacinth, Hydrangea, Iris, Lathyrus, Lavender, Leucocoryne, Litres, Timonium, Matthias, Menthe, Phalaenopsis Orchid, Phlox, Platycodon, Roses – Memory Lane, Scabiosa, September, Statis, Stock, Sweet William, Syringa, Trachelium, Triteleia, Tulips, Vanda Orchid and Veronica. Peach Wedding Flowers for London Brides –The colour peach means charm, good luck and immunity. Peach balances well between red and orange and is popular for pastel coloured bridal bouquets. For English country garden weddings, peach flowers are often mixed with pastel green and creams in a bridal bouquet. Peach calla lilies work beautifully with peach roses and a cream hydrangea for a wedding bouquet. Lilac wedding flowers – The colour lilac is a lighter tone of violet and is seen as a light purple. Lilac is a popular colour that is favoured by many UK brides.